Premium/Paid Section: An area restricted to paying customers where they get premium support or content. 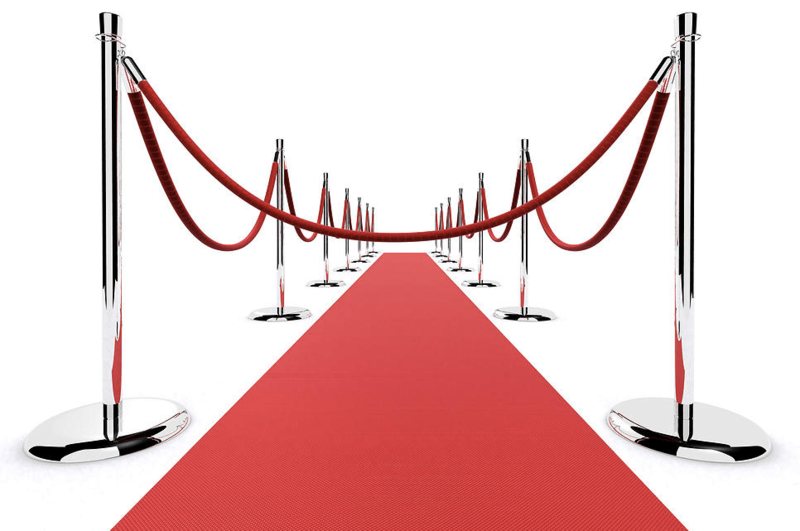 Pre-sales: If your customer forum is private, a public section where prospects can ask questions. Power User Feedback: Give special access to power users to give feedback on your product or services. Maybe even as a focus group. 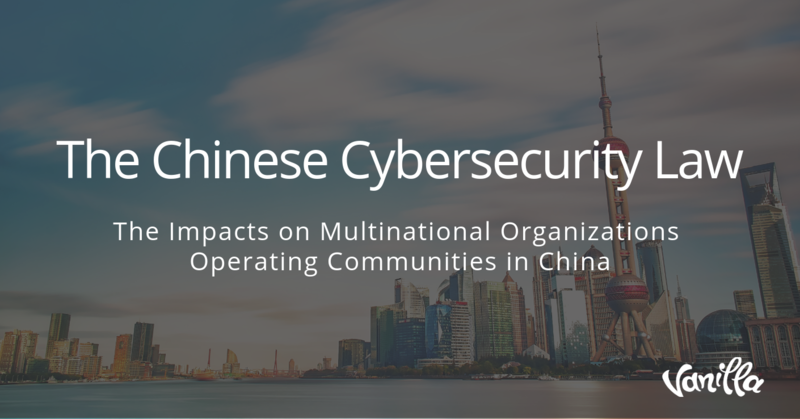 Community Moderators section: A space only viewable by the moderator team to discuss issues, policies or get clarity on rules. Staff section: You can have a category just for staff, to discuss company policy, strategy and more. How to achieve this in Vanilla Forums? 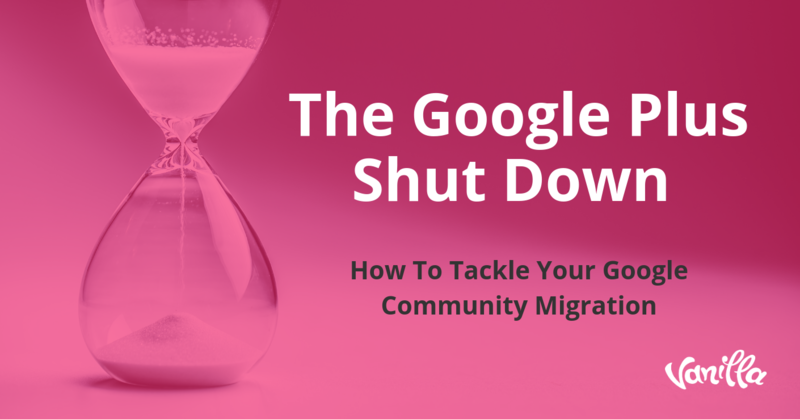 First, you need to create categories to load your restricted content. See this post on how to create categories. 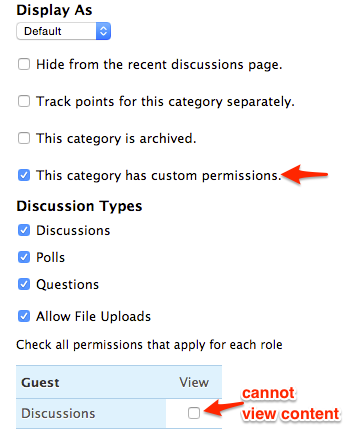 Be sure to select the "This Category has custom permissions" checkbox. 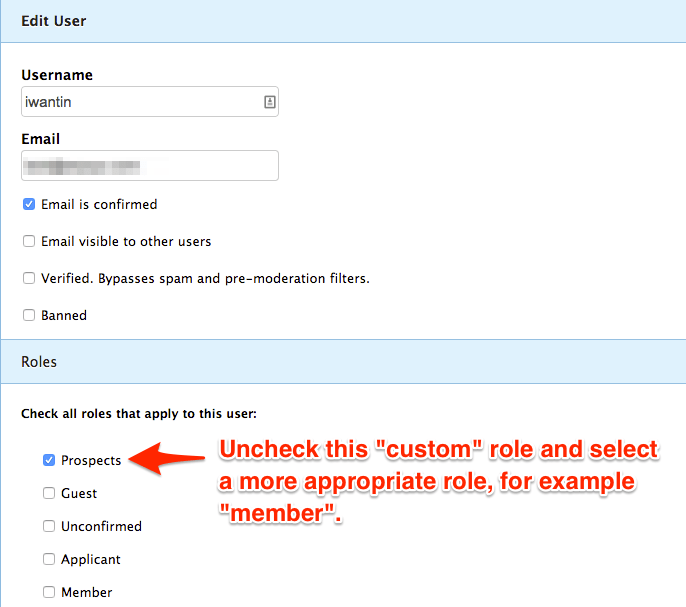 Your restricted content may require a new role, separate from the default Vanilla roles. 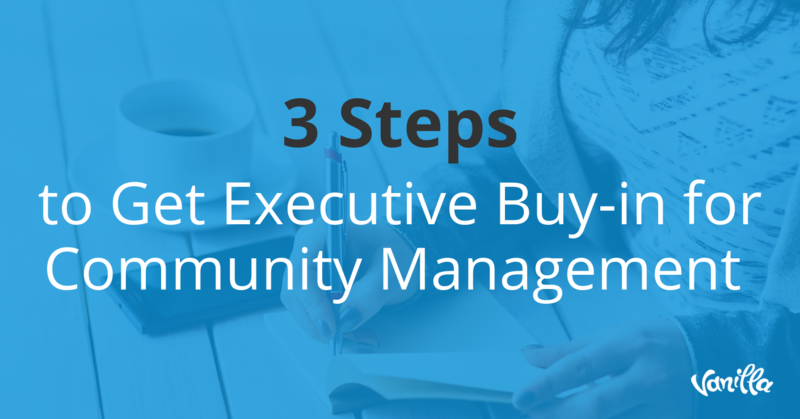 For example, if you're creating a support community and you want a section for Pre-Sales discussions, you can create a new role called Prospects. You can do this by heading over to the Roles & Permissions. This can be found under "Users" in your Vanilla dashboard. 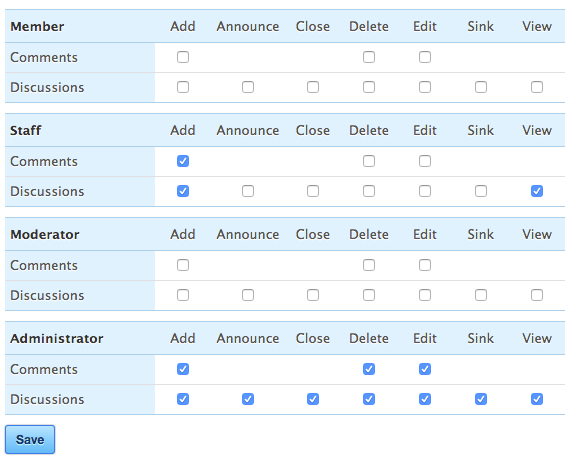 Select Add Role and you will be given a table to select what permissions you wish to assign to that role. You should modify how they will interact with Default Category Permissions. The default permissions control how a user interacts with every category that does not have custom permissions. As the following shows, they have now have no access to any content in the community, except the Pre-Sales category. If you haven't already created a Pre-Sales category (before you created the role), you won't see that option. 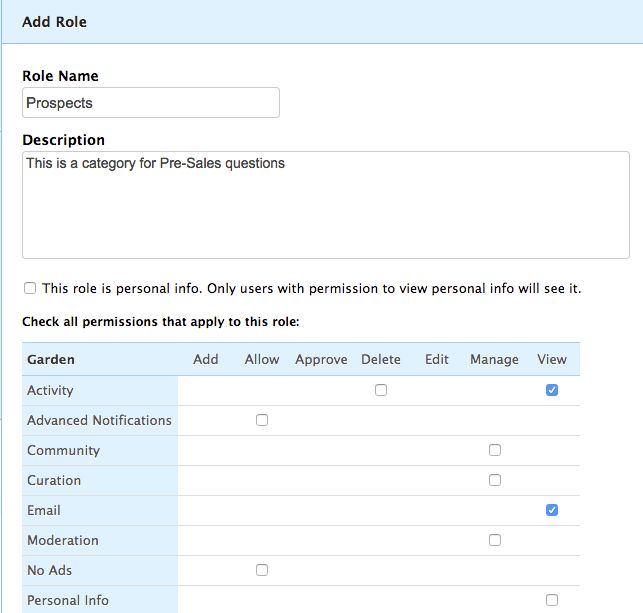 Create the a Pre-Sales category first and select custom permissions. 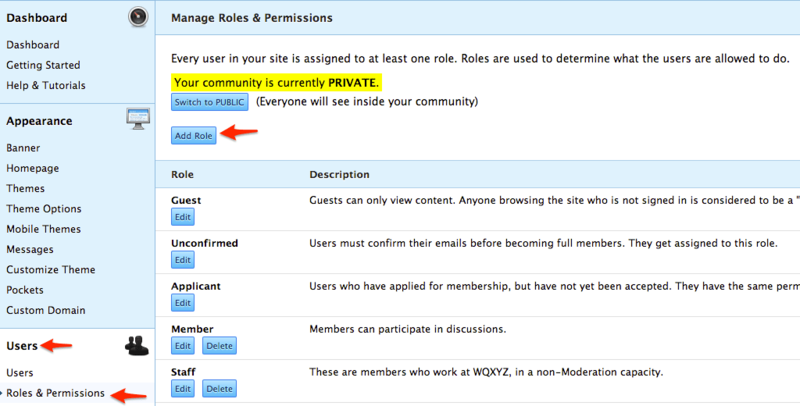 Once you save the new category, you can go back to manage the roles permission and modify their access. You can change any user's access by changing their role. 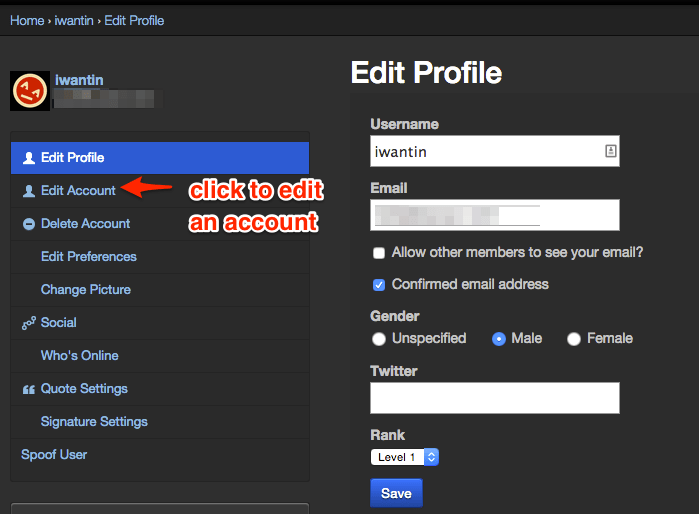 This can be done in the user table from the dashboard or from a member's profile. If you are looking to automate the experience (perhaps via paid memberships, or ties to your own existing membership list), we have you covered with our jsConnect library via SSO. You can learn the technical aspects of this here, but the basic premise is that you will be able to pass role info into your Vanilla powered community from your existing site using SSO. If you're using WordPress, our free plugin is easy to set up and does all the work for you. If you're using WordPress and want to charge for access to content, you can use our Wishlist integration to pass user roles right into Vanilla.